The lengthy feature list and smart editor make Wix a great website building choice, but the limited support might be an issue for big business sites. Wix is a giant of the website builder industry with 1,800 staff worldwide, a reported 110 million users and a claimed average of 45,000 new signups every day. Browse the Wix website and clues to this success appear right away. The service isn't just packed with appealing features, but the firm does its best to outperform everybody else, and there's plenty to appeal to everyone from the total design newbie to big business and experienced web developers. While some services give you only a few templates, for instance, Wix has more than 500. Its built-in image editor has 40 Instagram-style filters. The blog supports 26 languages. The App Market has more than 200 widgets for enhancing your site and integrating third-party sites and services. Looking to build a web store? Wix has plenty of e-commerce templates, too. And the company doesn't have any transaction fees on your sales (whereas Weebly, for example, charges 3% on some accounts). This isn't quite as good as it sounds. The templates aren't responsive in the usual sense, although the effect is very similar (Wix can generate a separate mobile version of the site and use it when necessary). Some features, like form building, come in the form of apps which require extra payments to get their full functionality. But nonetheless, this is a powerful and comprehensive service with a lot to offer all classes of user. Wix's free plan includes Wix branding, gives you access to the drag-and-drop editor, and in theory supports an unlimited number of pages. In practice, though, a 500MB storage limit and maximum 500MB data transfer per month mean it's only suitable for very small sites. More demanding users might prefer Weebly, which offers unlimited bandwidth for all its plans. The Connect Domain plan lifts your bandwidth limit to 1GB and allows using your own domain, but still includes Wix branding. It's priced at £2.55 ($3.32) a month for the one-year package. The Combo plan offers 2GB bandwidth and 3GB storage, and finally ditches the branding. There's a free domain, you're able to use a customized favicon, and you get $75 (£57.69) of ad vouchers. It's yours for £5.16 ($6.71) a month. The £7.76 ($10.09) a month Unlimited plan gives you unlimited bandwidth, 10GB storage, premium form building and a Site Builder app to drive more traffic to your site. The £10.10 ($13.13) eCommerce plan doubles storage to 20GB and includes an unlimited web store. That's much cheaper than many services – you could expect to pay twice as much with a rival outfit. The VIP plan completes the range by adding support for 10 email campaigns a month, and gives you a professional site review, for £15.57 ($20.24) a month. Signing up for Wix Free gives you as much time as you need to try out the service basics, but Wix also has a no questions asked 14-day money-back guarantee for its Premium products. Wix does its best to get you quickly up to speed. Account creation is as simple as entering your email address and a password. You're asked to choose the type of site you'd like to create – business, photography, music, blog and so on – and then asked whether you'd like Wix Artificial Design Intelligence (ADI) to build you a site, or you'd prefer to create one yourself in the full editor. ADI essentially gives you a faster site creation process and a much simpler editor. Tell it the type of site you want to create, the features you need (selling online, taking bookings or appointments, getting subscribers, a blog), impart some social media and contact details, and it quickly creates a site to match. The regular editor takes a straightforward but more manual approach. You start with a template, and can then customize it by dragging and dropping the full set of Wix components onto the page (you get many more options than with ADI), or tweaking and adjusting elements that are already there. While this is much more powerful, it also has a potentially significant disadvantage. ADI allows you to change your layout after you've created your site, but once you've selected a template in the standard editor, there's no way to switch it later. Some services, such as Weebly, allow you to change your template at any point, a far more flexible approach. Our preferred option would generally be to use the full-strength Wix editor. It does have a lot of features to cope with, but they're well designed and presented, and even beginners should find it relatively easy-to-use. But if your needs are simple, you've never used a website builder before, or you're just in a hurry, having the ADI-guided approach to website creation might save you a little time. The ADI editor is stripped back with a very minimal interface. It displays your web page, two or three buttons, a menu bar with some key functions (Add, Site Design, Manage), and that's it. No sidebars, floating palettes or anything else to get in your way. You can modify your site in simple ways. Hovering your mouse cursor over a section displays buttons to edit it or change designs. Or you can click something to view and edit its properties in a sidebar (edit text, replace an image and so on). But the ADI editor doesn't allow you to drag-and-drop controls around on the page, resize them, adjust fonts and colors or otherwise apply low-level tweaks. If your needs are basic, that may not matter. You can still set up the site, populate your web store, write blog posts, preview and test your pages and put them online when you're done. You can also switch to the full-fat Wix editor at any time (which is also what you get if you don't choose ADI initially), but the problem is that you can't then switch back to ADI and keep your changes. It's an either-or decision, simple ADI or full Wix power: there's no way to combine the two, unfortunately. Opting for the regular editor gives you complete control of layout. Objects can be positioned with pixel-level placement, rather than being automatically aligned in blocks or columns. You can drag-and-drop complex blocks (contact forms with headings, buttons, text) as a whole, change alignments, or ungroup items within a block to rearrange them however you like. Visual tweaks include neat animations and color filters for images, and you can assign a range of actions to most objects. For example, clicking an image might open a link, allow the image to be magnified, or to display it in a popup. You can add all the usual elements to your page in a couple of clicks. Text blocks, images, menus, galleries and slideshows, buttons, social media elements, blog and e-commerce blocks, there's plenty to explore. One major highlight of the editor is its visual previews, enabling you to see any component before you add it. Choose Gallery, for instance, and you don't just get text items such as Collage or Grid. Instead, the editor displays thumbnail previews of what each option will look like, helping you to immediately choose the right component. It's a similar story when you're browsing buttons, menu styles, or audio and video players – Wix always clearly shows you what you're going to get. The WYSIWYG approach doesn't stop there. Dragging and dropping a gallery doesn't leave you with some empty frame or plain dialog box. Instead, Wix galleries are populated with sample images by default. That's ideal if you're creating a quick mock-up, as it gives you a feel for how the page will look without having to manually add a single picture. The core editing functions are equally well designed, and are more like a native application than the average website builder. Right-click menus show you appropriate commands for different controls, for instance. Alignment guides and on-screen displays of control heights and widths help you position and size items accurately, and floating toolbars give speedy access to key options and features. The editor supports a vast number of keyboard shortcuts, a major plus if you regularly use them in other applications. You can Shift+Click or Ctrl+Click to select multiple items, then use standard key presses to delete, copy and paste them, send them to the front or back of the page, save the project, preview it, undo actions if you've made a mistake, or redo them if you've changed your mind. Put this all together and the Wix editor feels polished and professional, with both the visual cues that beginners need, and the shortcuts and workflow support that experienced users expect. We experienced one or two odd technical glitches – Google Chrome locking up with high CPU usage, forcing us to close the editor – but we couldn't clearly identify the cause, and overall Wix performed very well. Wix offers wide support for multimedia, with native components to display single images, slideshows, image galleries, music and video files in all the main formats. There's support for directly importing or playing media from Facebook, Instagram, Dropbox, Google Drive, Flickr, Google Photos, YouTube, Vimeo, Dailymotion, SoundCloud, Spotify and more. A "My Uploads" area enables building your own cloud-based media storage bin. If you've got 10 images you'll use on multiple pages or sites, for instance, you can upload all of them to Wix. You'll then be able to access them directly from the Add Images dialog without having to upload the files each time you need them. Wix supports images up to 25MB in size, but keep in mind that the Wix starter plans have storage limits (500MB for the free options, for instance). This isn't going to be a smart way to store your library of hi-res PNGs. If you don't have the images you need, Wix provides access to a basic set of free images and clipart. You can search these by keyword, but our test searches returned fewer and lower quality results than most of the competition. Still, there's enough to get started, and access to Shutterstock's collection gives you professional images at a discount price of £2.08 – around $2.70 – for a single image that can be used across all your Wix sites. Weebly charges almost twice that. The Wix App Market has further add-ons to give you more playback features, higher bandwidth, user stats, document viewers (PDFs, Google Docs, Sheets, Drawings and Slides) and more. They're welcome, but keep in mind that although most are free in some form, they often require extra payments to remove branding or get their best features. Wix's blogging platform is easily accessed from a standard button on its left-hand toolbar. In a click or two you're able to add a new blog post, customize its layout or change how you would like the blog to work. Blog posts are creating using a simplified editor, but this still has a decent set of functions, including options to add images, galleries, videos, music, GIFs and custom HTML. There are plenty of ways to customize a post. You're able to add tags and categories, define related posts, and set meta titles, meta descriptions or separate mobile-friendly titles. And once you're done, posts can be published immediately or scheduled for some future time. Our test blog allowed Facebook comments by default. A separate app supports Disqus comments, and there's another standalone comments app, although the free version has some annoying limits (10 comments per post maximum). Once you're set up, there are some welcome and relatively unusual extras. Posts can automatically be published to Facebook. You're able to automatically email a snippet of any new post to your subscribers. An Insights system gives you some basic stats and analytics on your traffic, and Google AMP support may get you faster mobile load times and better search engine rankings. Put it all together and although it's not going to compete with WordPress, the Wix blog is a capable platform which tramples all over the feeble offerings from most website builders. Building a web store with Wix seems very simple. Browse an array of templates, add any extra components you need, and the visual previews and sample images make it easy to define the look and feel of your store. Don't be fooled, though: there's plenty of power under the hood. Wix supports digital as well as physical products, for instance. That's good news, although Weebly goes further with the option to sell services (landscaping, dog grooming, anything that involves your time and an activity rather than a standalone product). Products can be illustrated with videos, as well as images. You can give them custom options (size, color), a weight or an SKU (a product code to enable automatically managing your inventory.) You can promote them with coupons, organize them into collections, or set up your own shipping and tax rules, although this can get complicated if you're hoping to ship to many countries and areas. Wix supports plenty of payment providers, and takes the time to show you only those available in your area. We tested Wix from the UK, and the site claimed it could work with Square, Stripe, Moolah, Worldpay, Wirecard and PayPal. Whatever you choose, Wix doesn't add any transaction fee of its own, so you'll pay your provider only. Wix stores can't quite match specialist e-commerce solutions (or for that matter the best web hosting providers), but that's no great surprise. The service does make it easy for personal and small business users to start selling online, though, and considering the low price you're paying, that's good enough for us. Wix has a lot of built-in support. Left-clicking any object in the editor displays a toolbar with a Help icon, and a Help menu is permanently visible in the editor's own toolbar. Separate screens like the Blog Manager always have their own Help icon in the top-right corner. Help accessed from the editor is displayed in a small pop-up window, which is handy as it means you're not taken away from the work area. Other support areas, such as the web store manager, get an entire tab to themselves, and you can also access the support pages directly at any time. The individual articles are mostly of above-average quality. They're well presented, for example with occasional animated GIFs to illustrate interface actions, and they try to address the needs of beginners and expert users. We spotted some problems, though. Searching for 'Blog' in Help returned articles which all said they referred to the old blog, and for the new blog we should go somewhere else. Launching the Blog Help Center similarly told us "this article is about the previous Wix blog" and gave us another link. Did this mean we were using the wrong help, or was our template using an older version of the blog? And as we think the blog change happened in 2015, why hasn't Wix got this sorted out some three years later? The knowledgebase structure is another issue. There are more articles than necessary, and some have very similar titles, or overlap in their coverage. Furthermore, the search engine finds related articles to your key words, but doesn't do a good job of ordering them. None of this stops you finding what you need, but it might take longer than you expected. If you need more help, support is available via a ticket system. We asked a simple question and got a helpful reply within 36 hours, which is a little slow, although it might be acceptable for basic queries. But we've also seen many customers give Wix terrible reviews for its support, and although we can't let those affect our score – we only review what we see and experience ourselves – we would recommend caution. Test the service with questions of your own before you trust it with anything important. Wix offers telephone support, too, but that's also not quite what it seems. You can't call Wix when you like – your only option is to request a call-back. That's only available from Monday to Friday from 6am to 5pm Pacific Standard Time, and even then, the company warns "these hours may fluctuate due to high call volume". Which presumably means: ‘don't be surprised if you wait around but we don't call you after all’. Home users probably won't be too worried by this, but if you're running a big web store and every hour of downtime is painful, this could be a real problem. Again, make sure you test the service carefully before you buy. 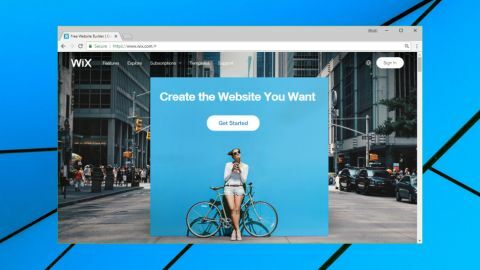 Wix's attractive templates and excellent editor make it easy for even total design newbies to build a great-looking, powerful website. We're less convinced that Wix has the support services that big websites require, but the core features are so strong that you need to try it yourself. Find out the best website builder you can get today. As chosen by our experts.